This room isn’t for those on a budget, but stay tuned for a budget friendly version in a few days. This nursery is full of beauty. 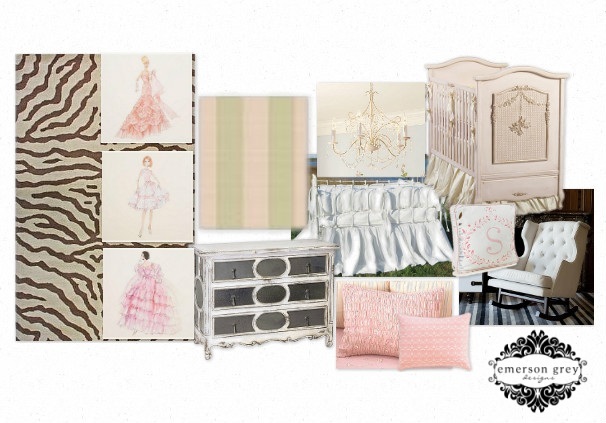 From the gold-dusted crib, to the chandelier, the mirrored chest of drawers…oh, what a little girls dream. This can easily be created into a big girl room by just getting rid of the crib and bringing in a beautiful bed. All white bedding is a great way to allow the other elements of the room to shine, but a way to still allow the bedding to be dramatic. Look at how long that crib skirt is…it screams look at me. And for a little juxtapostion that is always fun, why not throw in a muted animal print rug? I would. Delicate pillows and the amazing lines of the rocker sum up this Barbie nursery.